There are probably three of four courses in the United States that claim to have been the first in the New World, the very first place on this side of the Atlantic Ocean where eager young sportsmen swatted at their imported gutta balls with their imported hickory clubs over whatever spare ground they could find. The place with perhaps the most legitimate claim, however, is Oakhurst Links in White Sulphur Springs, W. Va which began the 2013 season on May 31st under new management having been purchased in October of last year by the world-famous Greenbrier Resort, just three miles away. For those whose love of the game extends beyond a mild curiosity in its history, the sale of Oakhurst to Jim Justice’s impressively revamped Greenbrier came as a big relief as the previous owner, Lewis Keller, had struggled to find a buyer for several years. Keller had owned the 30-acre property since 1959 but hadn’t restored the long-abandoned course until 1994. Getting on in years, Keller looked to offload it and move to a retirement home in Virginia but was unable to find a buyer, meaning it went up for auction in July 2012. A businessman from Wheeling W. Va made a successful offer of just $410,000 - well below what Keller was hoping for - for the land first ‘developed’ in 1884 by Russell Montague who had caught the golf bug while studying in Great Britain. The winning bidder was unable to raise the necessary funds, however. Foreclosure looked to be the most likely outcome. But Justice, who bought the Greenbrier for ‘just’ $20m (plus a whole lot of debt) in May 2009, didn’t want to see Oakhurst Links fall into the hands of those who could not have cared less about its past, and paid Keller an undisclosed sum thought to be less than $1m but significantly more than $410,000. 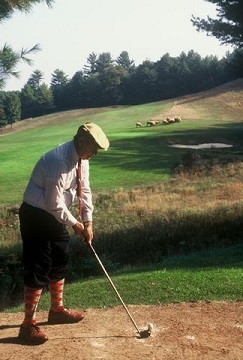 Unlike Keller who welcomed outside play, the Greenbrier has decided the course will be open only to resort guests who will pay either $175 for 18 holes (the Brassie), a tour of the museum, lunch, photo, and commemorative certificate stating ‘I played the oldest golf course in America, or $135 plus forecaddie (the Niblick) for nine holes, a tour of the museum, commemorative certificate, and photo. The Greenbrier says playing Oakhurst Links will be an upscale and extraordinary experience - not just “going over to the ‘old course’ and hitting some balls around”. Gutties and hickories will be provided by the Oakhurst Golf Shop, and guests will have the option of being outfitted in period clothing.